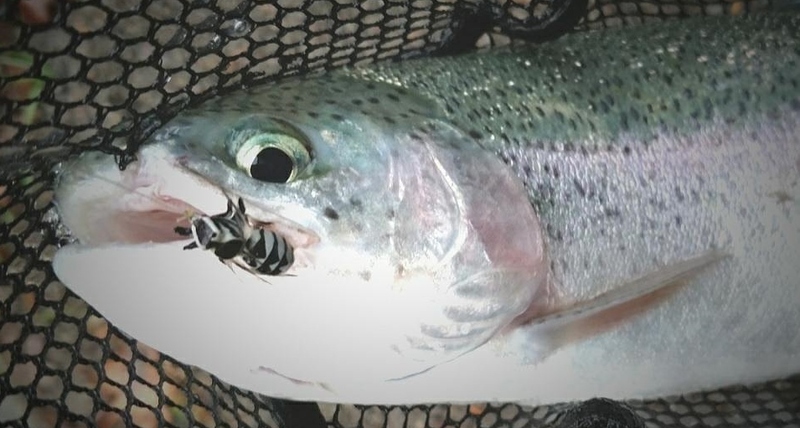 Stoneflies are a significant part of the trout’s diet and consequently of every angler’s fly fishing. 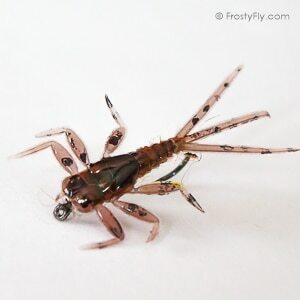 Fly fishing stonefly patterns has its advantages over other insect species. 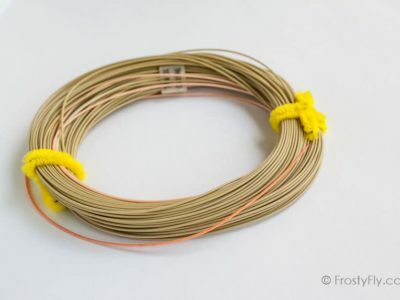 Two main reasons for their big significance in fly fishing world would be first their availability and secondly, their size. They are widely spread insects and can be found on every continent (except Antarctica). In terms of seasons, stoneflies are available year-round. Stonefly life cycle is quite long – the larger kinds live even up to three years out of which they spend a great portion as large nymphs.There are species of stoneflies that are available as food for trout as adult flies even in the late winter and early spring, long before mayflies start coming out into the scene. 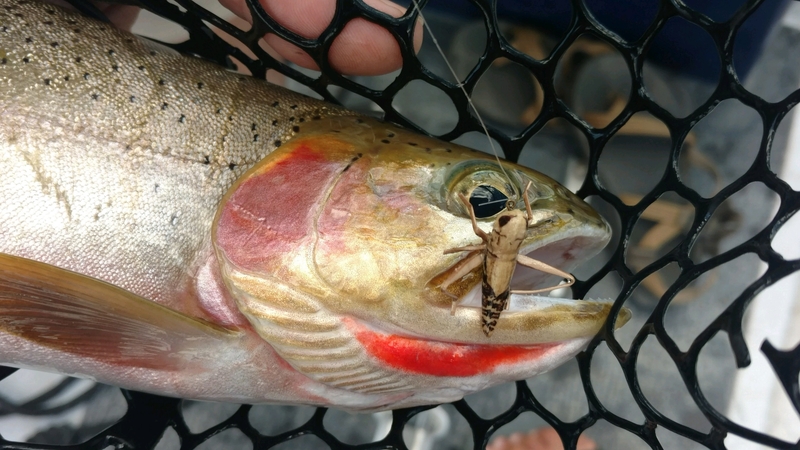 Stoneflies are quite large insects and represent a big and nutritious meal for the trout. Some species grow to be bigger than 5 cm. Such opportunity will not be easily passed by a hungry trout. Fishing stonefly nymph patterns can prove quite effective all year round, especially in situations when all other patterns fail. 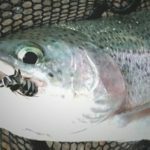 Having a realistic pattern of this fly is an added bonus – something that can bring you great strikes even when trout is super selective. Stonefly is an aquatic insect from the order Plecoptera. 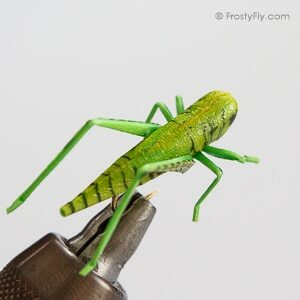 These are one of the oldest insect species, with over 3500 different varieties and can be found around the globe, everywhere except Antarctica. They love clean environments and their presence indicates very high water quality. Through their life time, stoneflies go through incomplete metamorphosis. They go from egg, to nymph and straight to adult, without the pupal or dun stages. 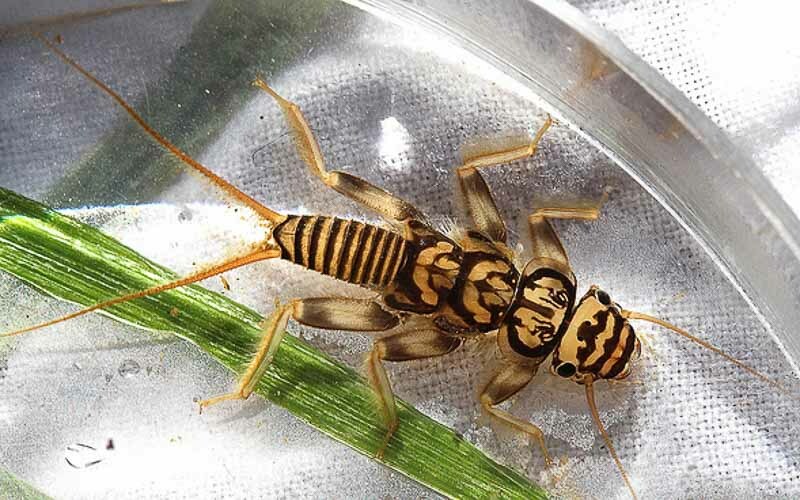 Complete stonefly life cycle lasts anywhere from one year (for smaller species – yellow sallies) to three years (larger kinds – salmonflies and large golden stones). 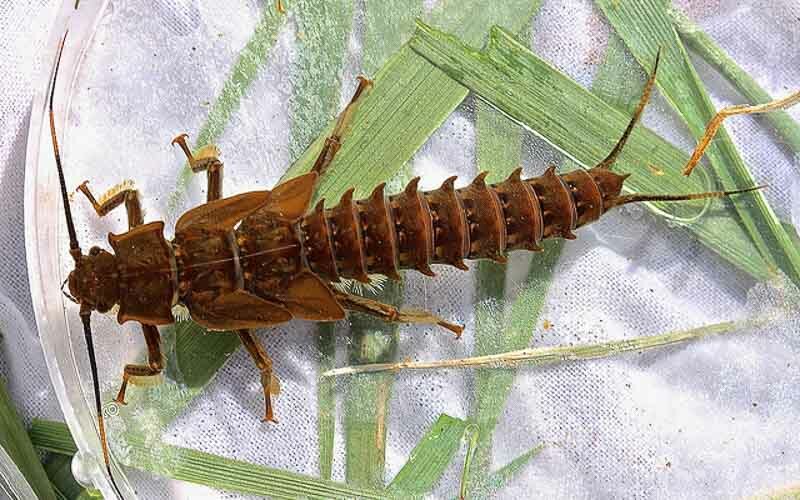 As nymphs, they breathe through either strongly developed gill system, or directly though their exoskeleton, but are very dependent on highly oxygenated water – flowing, faster, moving rivers – environments where you will mostly find them. As cold water contains more oxygen, they are more prevalent in higher elevations, colder climates, than the warmer, southern rivers. This is especially the case with large species – salmonfly and large golden stones. Stonefly nymphs spend most of their young life under the riverbed, in crevices and spaces between stones and pebbles (hence the name). As they mature, they start slowly moving towards the surface of the riverbed. Most stonefly nymphs are herbivorous and feed on benthic algae and rooted vegetation on the riverbed. Large golden stonefly is a carnivore and feeds on caddis nymphs, mayfly nymphs, midges and smaller stonefly nymphs. When stonefly nymphs are about to emerge, they start their migration: they start heading from the faster currents towards the shore where they would go through their metamorphosis. During the time of this migration is when you can find them in greatest numbers at the edges of riffles, close to the shore. At that time, trout can often be spotted in these shallow waters by the river’s bank, waiting patiently and catching their juicy prey. 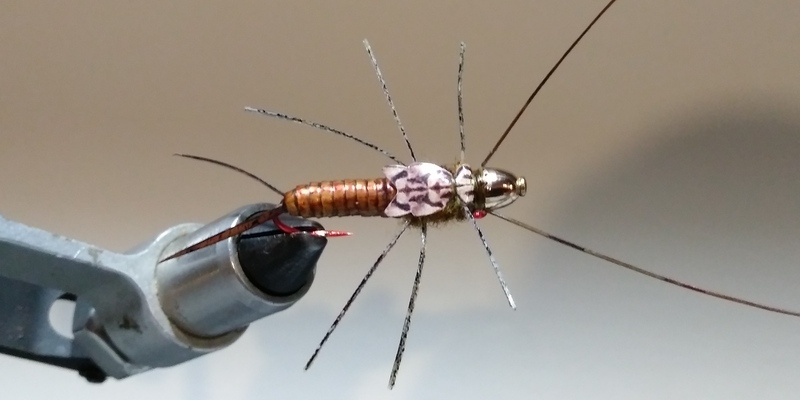 This would also be the best times and places to fish stonefly nymph patterns. 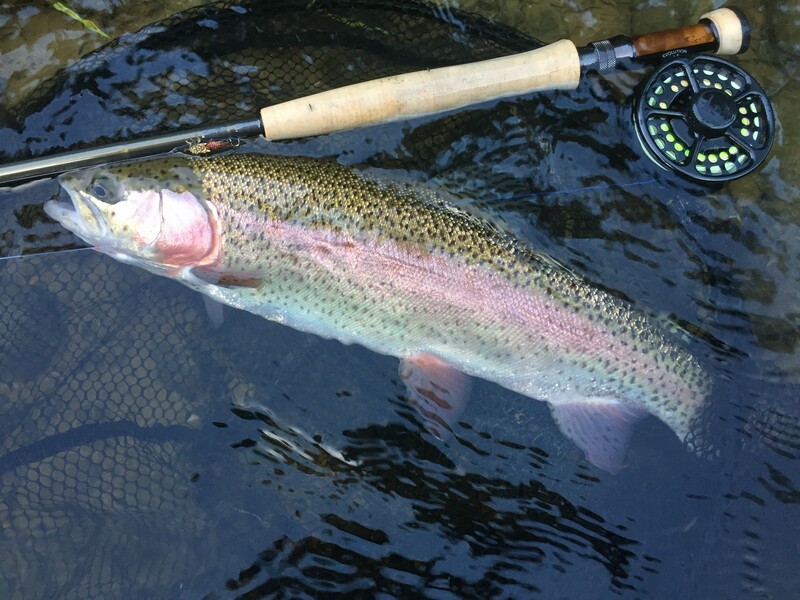 Important here is the fact that the greater the numbers of the nymphs, more selective the trout becomes and more realistic looking your pattern has to be. After they gather close to the shore, they continue their journey towards the land, usually far from the shore, climbing out on the surrounding rocks and grass twigs, some even go up the trees. This is where they emerge, leaving their nymphal cast shucks. Stoneflies emerge at dusk or just after dark. 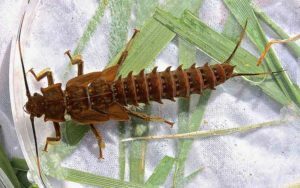 They attach to a fixed surface, they grasp a rock or a tree trunk, their husk splits open and the adult stonefly emerges. Their wings get released from their wingcases. After a couple of minutes the wings get hard enough for them to fly off. Or, they simply crawl away into the sheltered place until they are ready for their first flight. 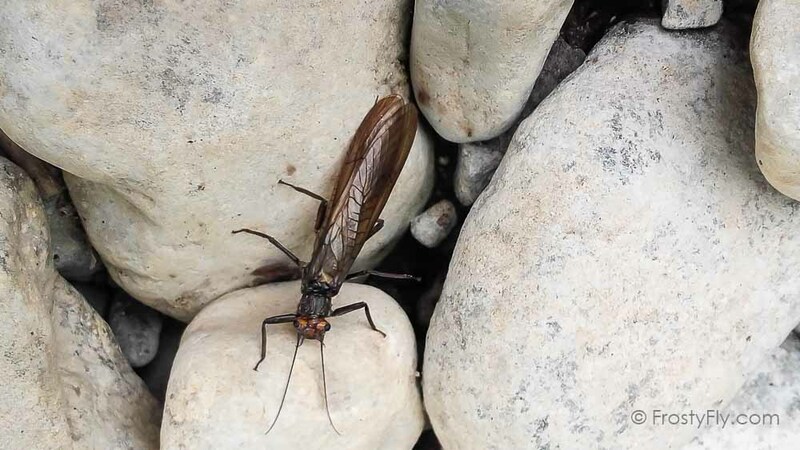 This emergence of stoneflies usually starts first in the downstream sections of the river, where the water has warmed enough, and then moves upstream. 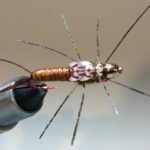 For a fisherman, getting into the right sections of the river at the right moment is crucial when comes to fishing stoneflies during their emerging stage. Stoneflies live relatively short time as adults, compared to their nymphal phase. Smaller species live just a couple of days, while larger ones can live up to a few weeks. Different from mayflies, some species feed during this period, nibbling on vegetation. Their mating, unlike mayflies, takes place on the ground – mostly in the grass. 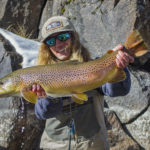 For a fly fisherman, the most significant event in an adult life of a stonefly is the moment they deposit their eggs into the river, when they are most fragile to fish. 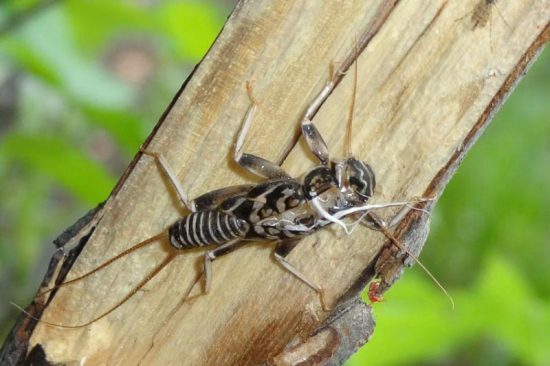 Most stoneflies release their eggs by dipping their egg-filled abdomens into water. They release large number of eggs, up to a thousand. 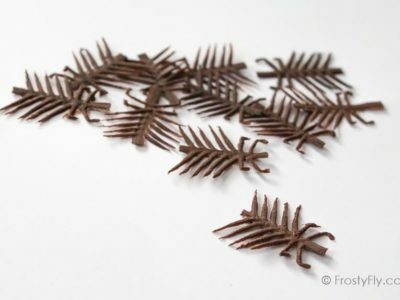 All of them are coated with sticky residue which enables them to adhere to the bottom better. 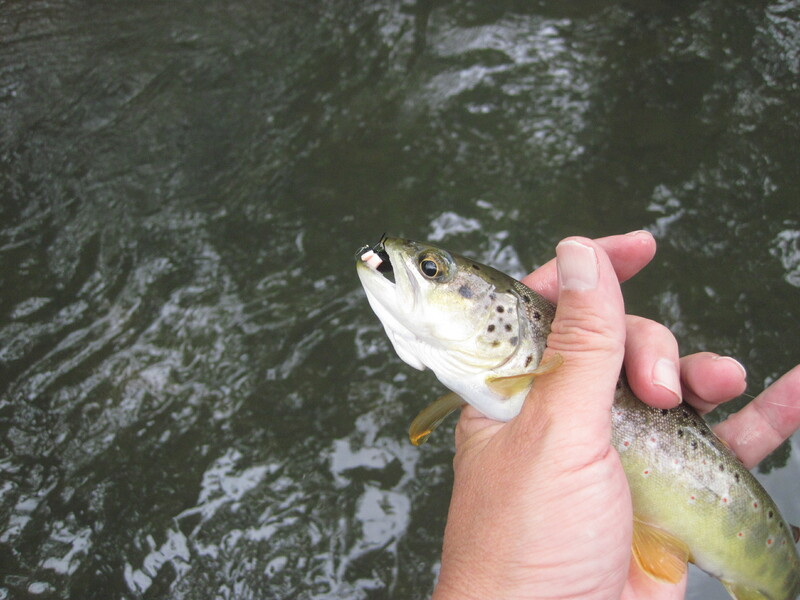 Egg-depositing is the point when they are very vulnerable, as the trout commonly grab them from beneath. 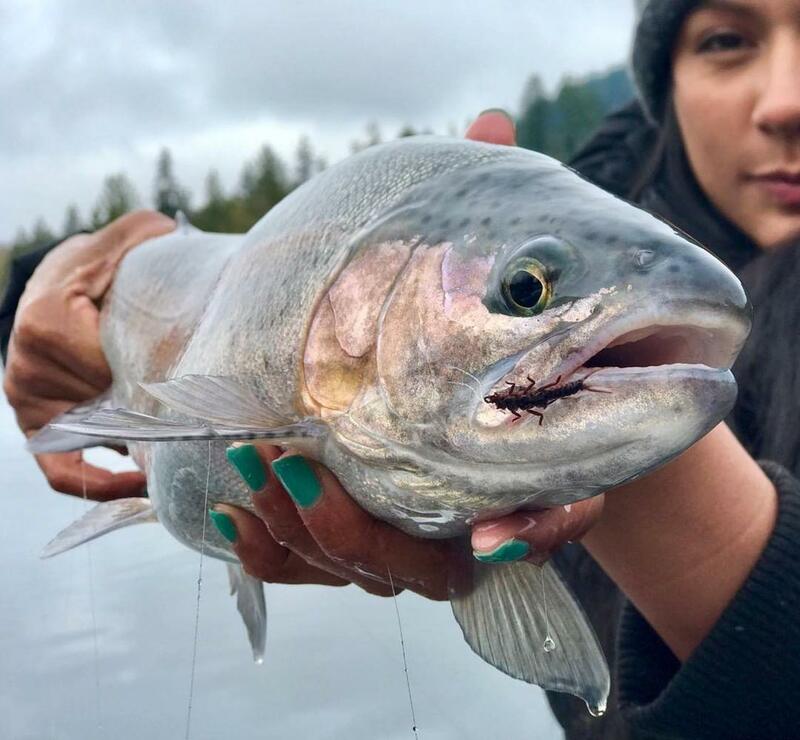 The fact that they often slap the surface of the water with their bodies in order to free the eggs easier doesn’t help their fragile situation – the slapping grabs the trout’s attention easily. Depositing of eggs is a sporadic event and rarely happens in larger concentrations. 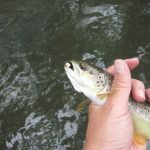 The smaller the numbers, the less trout would be selective, giving an angler an advantage in terms of how imitative their pattern has to be. However, when there are higher concentrations of egg-depositing stoneflies over the water surface, more realistic patterns come into the play. 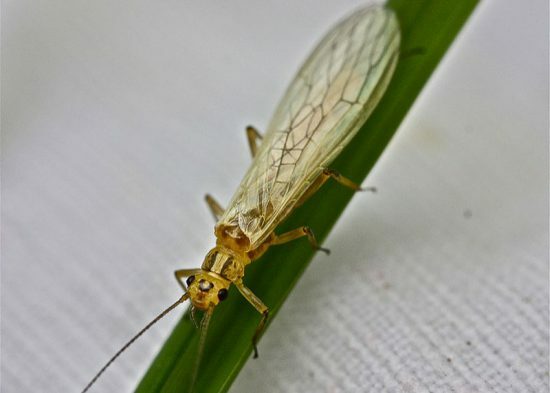 However, keep in mind that fishing dry stonefly pattern is effective throughout the whole hatching period, as many adult insects that are not depositing eggs get blown onto the surface by simple bad luck. Incubation of stonefly eggs lasts anywhere from a couple of hours to a couple of months, but most nymphs get hatched within one to three weeks. 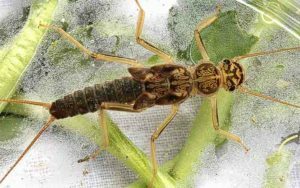 After the stonefly hatching season has finished, trout would shift their attention to the stonefly nymphs again, so comes the fall, stonefly nymph fishing takes the stage again. Stonefly nymphs, unlike mayfly nymphs, all have the same basic appearance, varying in size and color, but generally following the same body shape and structure. Their body is long and segmented, ending in two long tails. Most species have their bodies flattened. They have three pairs of strong legs, each ending in two claws that they use for gripping to the rocks in the fast currents that they predominantly live in. Their head has long antennae and large, compound eyes. On the back, they have two sets of wingcases, compared to one that mayflies have. They are not great swimmers and they mostly crawl gathering their food. 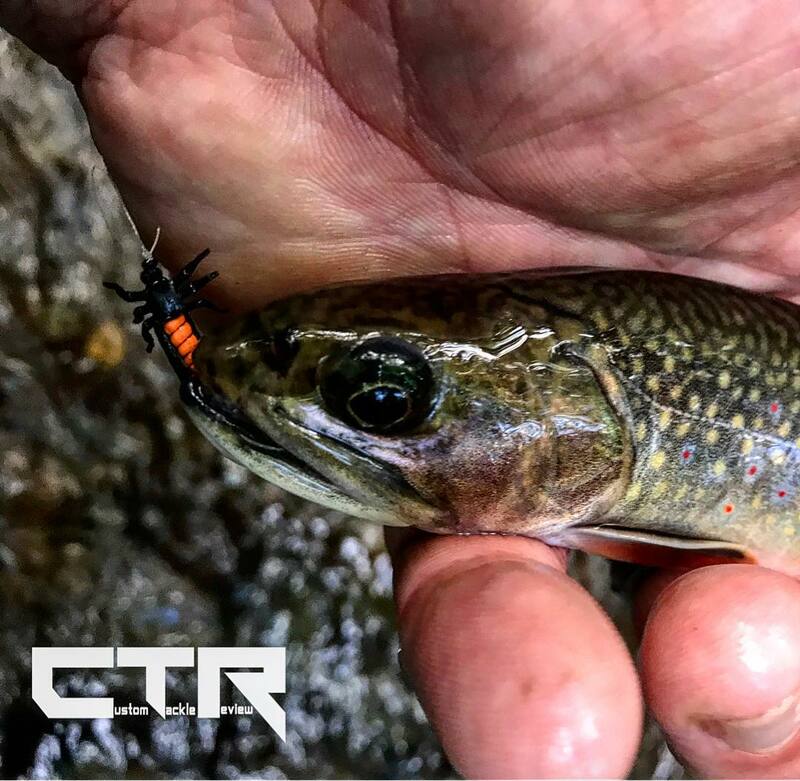 They end up in the fast current only during their behavioral drift or when they slip by accident, becoming an easy prey for trout. This is one of the reasons why stonefly nymph patterns are super effective year-round, even outside the hatching season. Adults have two pairs of long, elongated, membranous wings that are folded over their backs, making them distinct from other aquatic species. 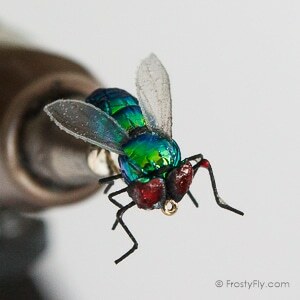 This is the reason these insects are sometimes called flatwings. They have two short tails and long antennae. Generally, despite their long wings, they are not strong fliers. This is the largest of all stoneflies with adults going as big as 5 cm. 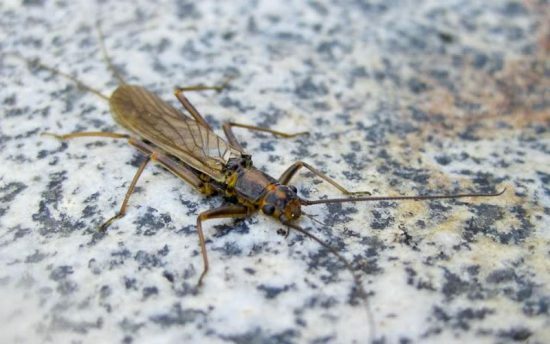 Partly due to its size, but also to their abundant numbers, these species of stoneflies are considered the most significant, if nothing – the most exciting to fish. 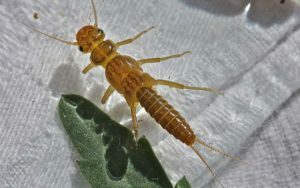 As nymphs, they are herbivores and move slower than other stonefly nymphs. They live in large, mid-elevation rivers, they prefer cold and fast waters. 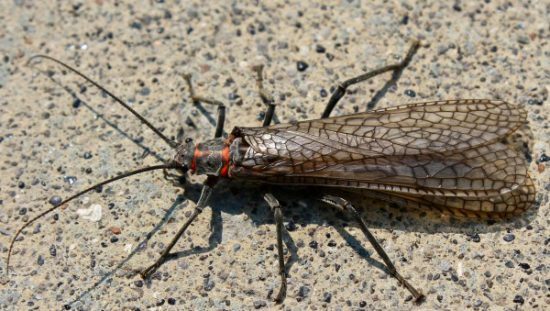 On the western shores of North America, the most prevalent is Pteronarcys californica, also called Giant Salmonfly, and its Eastern cousin is Giant Black Stone (Pteronarcys dorsata). Salmonflies hatch from April to July, depending on the region, with northern areas having a later hatch. Their coloring revolves around two main colors and their slight gradations: dark brown and orange. What is characteristic of salmonfly stonefly nymphs is the way they move (drift) through water – they curl up and let the water currant carry them. This is the same way they react to disturbance. 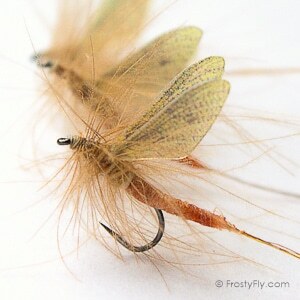 Size of the salmonlfy pattern goes from hooks #2 to #6. 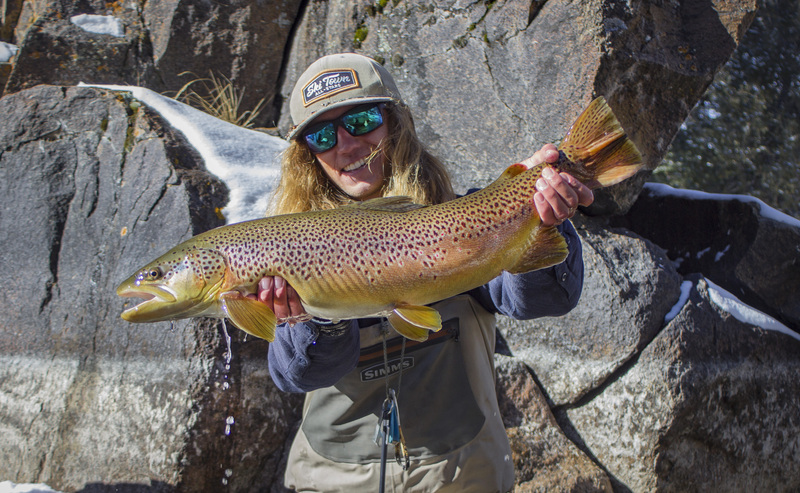 Golden Stones are most widely spread family of stoneflies and one of the trout’s most favorite food. They are lighter in color then the Salmonflies, have a distinctive pattern on their backs and longer tails and antennae. Unlike Salmonflies, Golden Stones are carnivores and are quite predacious. 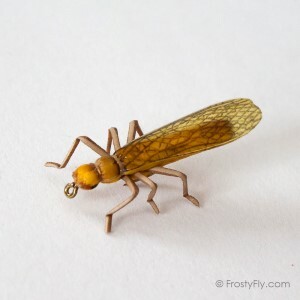 They are also known as Brown Willowflies, Stone Creepers and Common Stoneflies. They emerge after salmonflies, June to July, depending on the region. 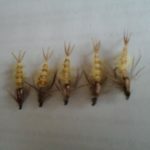 Coloring of the nymphs varies and goes from dark brown with golden pattern on the back, to bright yellows with dark patterns. Eastern species tend to emerge during night, so they are not as significant to anglers as their Western cousins. Golden Stone patterns range anywhere from #4 to #8. Little Yellow Stones or Yellow Sallies, also known as Stripetails, are recognized by their yellow and dark stripes along the top of their abdomens. In most species, adults are yellow, going from light to dark yellow. 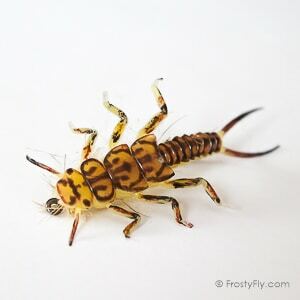 Yellow Sally nymphs don’t have gills and they are smaller stoneflies, with sizes (for both nymphs and adults) anywhere from 6 to 18 mm (1/4’’ to 3/4’’). Their lack of gills and the fact that they breathe directly through their exoskeletons, has made them more abundant in colder, smaller, higher elevation rivers, where the concentration of diluted oxygen is higher. Smaller, faster streams is where you would find them. Yellow Sallies are late emergers, most of them emerge during summer months – June to August, sometimes even late as October. Mating comes few days afterwards. Females usually deposit their eggs during warm afternoons. Yellow Sally patterns range from #10 to #16. 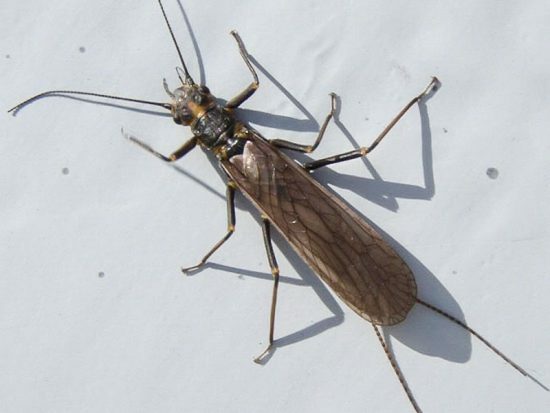 Skwala Stonefly, also called Large Springfly or Short-Winged Springfly, emerge early in the year, mid January, latest end of February, if the winter is colder. 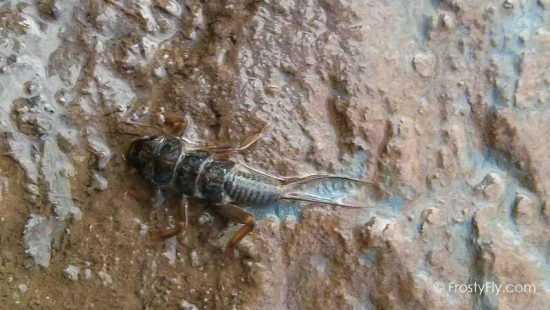 Interesting fact about them is that they emerge privately, hidden in crevices of stones, instead of out in the open, like other stoneflies. Most fisherman notice them only when they start their mating flights. Their egg-depositing is also specific as they prefer warmest parts of the day, mostly afternoons and when the water is calm. Skwalas tend to float long distances without being noticed on the surface of the water, partly due to their calm behavior (they do not flutter their wings as their cousins), and partly due to their dark coloring. 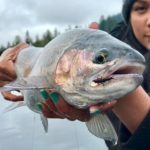 Their preference for warmer, calmer waters, combined with their early winter activity, causes their numbers to decrease after harsh and long winters and increase following warmer ones. Skwala patterns range in size from #8 to #12. Main technique when stonefly nymph fishing is to try to imitate the natural behavioral drifting of real insect down the bottom of the stream and keeping the fly on trout’s eye level. Drag-free dead drifting along the bottom is the best option. Start with an upstream short cast to allow the fly to drop to the bottom, then dead drift down the current until it starts lifting up to the surface. Extending the drift downstream as long as possible would pay off. Using strike indicator is recommended as it can greatly help in identifying the action. 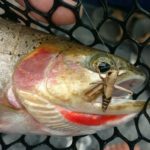 There are two instances when adult stoneflies can become food for trout: near the water’s edge, just after they emerge and when they accidentally fall into the water, and secondly, and maybe most significant for a fly fisherman, is the moment of the egg-depositing, taking place on the riffles. When fishing the recently emerged adults along the river’s bank, the best technique would be dead-drifting float, tightly against the banks, beneath the overhanging branches. 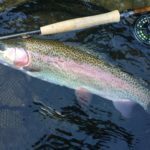 Should you notice that trout is ignoring your fly, try the occasional twitch – it can entice a strike as it could appear more natural to the trout underneath. 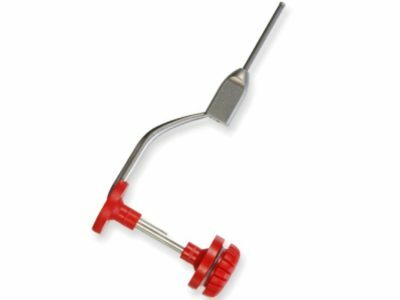 For fishing the riffles, when egg-depositing starts, usually in the evening, dead-drift is again the best presentation to utilize. However, to best imitate the natural behavior of the fly when they deposit eggs, an occasional hop or twitch could make a huge difference. Many stonefly females make a big splash when they hit the water and some continue to flutter while depositing their valuable load. Successfully imitating this behavior can entice the fish and bring you that big strike. 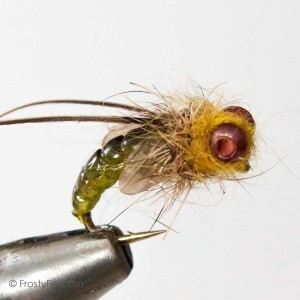 Cast the fly hard to make a splash and produce a commotion. Having your fly skate or skitter across the river’s surface might do the trick. 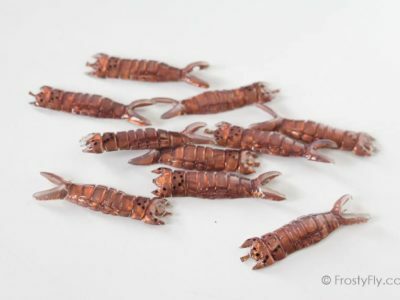 There are so many great recipes for tying stonefly patterns. Here, we have selected a few of our video recipes that have proven effective and that you might find interesting to try. These recipes were created and tied by Jim Misiura and Corey Cabral. All recipes have easy-to-follow steps and explanations. 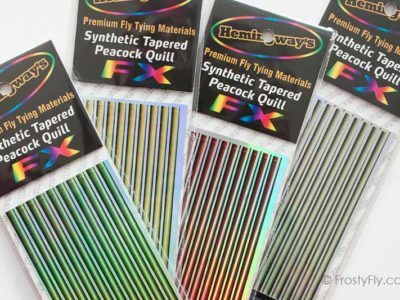 See our full collection of fly tying video tutorials for more great patterns and check out our amazing selection of fly tying materials.